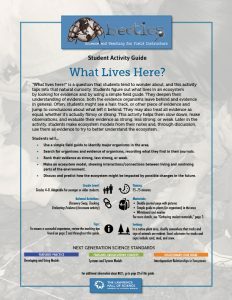 “What lives here?” is a question that students tend to wonder about, and this activity taps into that natural curiosity. Students figure out what lives in an ecosystem by looking for evidence and by using a simple field guide. They deepen their understanding of evidence, both the evidence organisms leave behind and evidence in general. Often, students might see a hair, track, or other piece of evidence and jump to conclusions about what left it behind. They may also treat all evidence as equal, whether it’s actually flimsy or strong. This activity helps them slow down, make observations, and evaluate their evidence as strong, less strong, or weak. Later in the activity, students make ecosystem models from their notes and, through discussion, use them as evidence to try to better understand the ecosystem. Use a simple field guide to identify major organisms in the area. Search for organisms and evidence of organisms, recording what they find in their journals. Rank their evidence as strong, less strong, or weak. Make an ecosystem model, showing interactions/connections between living and nonliving parts of the environment. Discuss and predict how the ecosystem might be impacted by possible changes in the future.